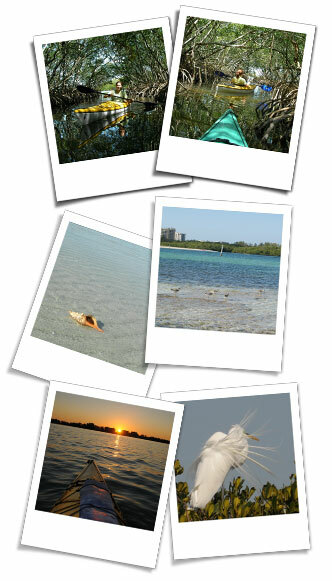 Southern Sarasota Bay has alot to offer paddlers of all abilities. From the exotic mangrove tunnels of South Lido Key to the enchanted mangrove islands of Roberts Bay with nearby bird rookeries to the open waters, sandbars, and grass flats of Big Pass. Wildlife abounds in these waters. Dolphins, manatees, egrets, herons, osprey, pelicans, eagle rays, mangrove crabs, hermit crabs, starfish, banded tulips, whelks, and sun-ray venus clams are some of the local wildlife observed on our tours. Your guides, Kim and Pete Hull, are both longtime Sarasota residents and trained marine biologists (both work at Mote Marine Lab) - let them share with you their knowledge and passion of this beautiful coastal estuary. We offer several destinations to choose from and will customize for your group. Paddle through a beautiful shallow lagoon and into a network of mangrove tunnels. Several fish species are abundant in these waters including the acrobatic jumping mullet. Egrets and herons stalk the elusive mangrove crabs amongst the mangrove roots. Osprey are sometimes observed diving for fish in the shallow lagoon. The Bird Colony Islands complex in Northern Roberts Bay is the most significant coastal bird rookery in the Sarasota Bay System. As many as 11 different species of birds use this area for nesting and resting habitat. Commonly sighted are egrets, herons, pelicans, and ibis with an occasional rare visit by roseate spoonbills. Big Pass abounds with wildlife. Paddle over shallow seagrass beds and peak into a natural aquarium filled with all kinds of fish and invertebrate life. Sometimes dolphins swim by or feed or play in the deeper waters. Birds rest on the exposed sandbars and manatees are sometimes seen at the edges of these sandbars in warmer months. The shallow waters surrounding these sandbars are excellent locations to learn how to stand-up paddleboard.